An average daily high of 56 in January and 60+ in February is a great excuse to get outdoors. Instead of bundling up to build a snowman, check out Greenfield Lake Park where you can bike or walk your way through the gardens, or paddle the lake. The Gary Shell Cross-City Trail provides miles of pedestrian and biking trails from Downtown Wilmington to Wrightsville Beach. Or, stroll along the scenic, nearly two-mile Riverwalk that skirts the historic Cape Fear River. Lined with an assortment of markets and some of the best boutiques and art galleries around, the Riverwalk is home to cafes with outdoor dining, riverboat cruises and boat tours. If you are a bird lover, check out this list of top spots to bird watch this winter, like nearby Kure Beach. Don’t stay cooped up inside. Instead, sightsee in Wilmington’s National Register Historic District via a horse-drawn carriage, Segue, trolley or walking tour. Spanning more than 230 blocks, it features churches, classic architecture, moss-draped live oaks, brick-lined streets and antebellum homes. When the sun goes down, take a Ghost Walk of Old Wilmington tour that will take you on a journey of the city’s most haunted homes and burial grounds. Instead of watching a movie from the couch, see why this city has long been a performing arts destination for theatregoers, live music fans and everything in between. One of the oldest and most beautiful theatres in America, Thalian Hall Center for the Performing Arts, has been in continuous use since it opened in 1858. If in town for the holidays, catch a classic performance of “A Christmas Carol” from Dec. 10-21. Visit the new Humanities & Fine Arts Center, eastern North Carolina’s largest and most technologically sophisticated performing arts center, and enjoy the North Carolina Symphony’s performance of Beethoven’s “Emperor” Concerto on Jan. 19. And if you are a jazz lover, check out one the largest traditional jazz festivals in the Southeast, the 36th Annual NC Jazz Festival, taking place Feb. 4-6. From traditional Southern fare to fresh seafood creations and international cuisine, there are plenty of options for even the most discerning palates. Options include manna (American cuisine featuring local, regional and American ingredients), Catch (seafood with a modern twist), Caprice Bistro (Wilmington’s only authentic French bistro) and The Basics (Southern comfort food). Taste Carolina even offers walking culinary tours of downtown restaurants and markets. And, if you’re a wine and chocolate epicure, don’t miss the Wilmington Wine and Chocolate Festival on Jan. 29-31. Perfect for those mild off-season days, Wilmington is located within an easy 30-minute drive of three distinct beach communities: Carolina Beach, Kure Beach and Wrightsville Beach. Instead of gliding down a wintry slope, rent a kayak from Kayak Carolina, and cruise the waterways of Carolina Beach. Stay active at Wrightsville Beach by taking a standup paddleboard lesson with the professionals at Wrightsville SUP or spectate at the Cold Stroke Classic, a standup paddleboard race on Jan. 23. In Kure Beach, take in the aquatic environments and wildlife at the North Carolina Aquarium at Fort Fisher or take part in the 151st Anniversary of the Battle of Fort Fisher on Jan. 16-17. Also, dogs are allowed on the beach with a leash through April 1, so bring along your furry friend! Some of the best things about winter vacations at the coast are the off-season hotel rates and no minimum stay requirements. 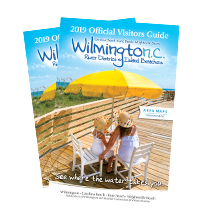 Choose from an impressive variety of accommodations in the Wilmington area ranging from waterfront hotels and historic B&Bs, to quaint houses and full-service hotels and resorts. With an abundance of wintertime activities – from outside activities to coastal fare to a rich local arts and culture scene – visitors are sure to have a memorable trip that offers an escape from the blistering cold, and a fresh perspective on this coastal-worthy season.